These Terms were last updated on 11 April 2014. Thank you for visiting Chat2Psychic at Chat2Psychic.co.uk (the 'Site'). 3.10 We will co-operate with any regulators (including, without limitation, PhonepayPlus (the UK’s premium rate services regulator)), law enforcement authorities or court order requesting or directing Us to disclose the identity of or locate any one breaching clause 10.4 and 12.1 or otherwise for the prevention or detection of crime or the apprehension or prosecution of offenders. There may be other circumstances in which We may be required by law or may exercise our discretion to disclose information about You or Your use of this Service to such persons. 4.1 We are Psychic Switchboard Limited a company registered in England and Wales under registration number 05371860 and our address is Orega Business Centre, 1 Hardwicks Square, London, SW18 4AW, United Kingdom. ('We'/ 'Us'/'Our'). 4.2 If You have any questions, complaints or comments on this Site then You may contact Us by emailing Us (found under www.Chat2Psychic.co.uk/contact-us.php), write to us at: Chat2Psychic Customer Services, Orega Business Centre, 1 Hardwicks Square, London, SW18 4AW, United Kingdom or call us on 020 7966 9626. 5.2 If You are a credit card customer you are allowed a specified number of minutes to make up your mind regarding your choice of Reader. If, for whatever reason you are not satisfied, you are allowed to change Reader at any time up to the specified number of minutes. Please note this offer is subject to 'fair use' policy and if you are deemed to be abusing this offer we will be entitled to suspend you from further use of the Services. In this instance you will be refunded the balance on your account less an administrative charge. 5.4 A Reader is not authorised to disclose or receive any personal or contact information. If a Reader offers or discloses this, please notify us immediately by completing the online form (found under www.Chat2Psychic.co.uk/contact-us.php), write to us at: Chat2Psychic Customer Services, Orega Business Centre, 1 Hardwicks Square, London, SW18 4AW, United Kingdom or call us on 020 7966 9626. A free reading of up to 20 minutes will be given to new customers who register a Chat2Psychic account subject to availability. This offer is available to first time callers with Chat2Psychic accounts only. Callers must be over 18 years old to obtain the Free reading and there is an absolute limit of one (1) free call per customer. 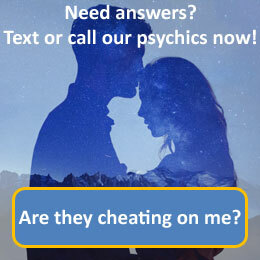 The offer does not guarantee a free reading at a specific time and if a specific Chat2Psychic psychic reader is unavailable at the time of the call then customers are invited to try again at a later date. Calls are recorded and are only free from a BT landline. Calls made from some operators, including cell phone/mobile operators, may incur network surcharges. Bill payer’s permission must be obtained before making the call. Chat2Psychic Free Readings cannot be transferred to third party accounts and cannot be redeemed for any other service, product or offer. This offer is not open to Chat2Psychic employees, suppliers or partners. 7.5 You are responsible for everything done using Your account. If you think that someone else may have access to, or be using, Your password or account, You must tell us as soon as possible by contacting Us (found under www.Chat2Psychic.co.uk/contact-us.php), write to us at: Chat2Psychic Customer Services, Orega Business Centre, 1 Hardwicks Square, London, SW18 4AW, United Kingdom or call us on 020 7966 9626. 9.1 The fees for the Services that you purchase through the Site will be stated on the Site, please click here for a link to the relevant section of the Site www.Chat2Psychic.co.uk. We may in Our absolute discretion choose to amend these from time to time. 9.2 You agree that you will pay for any Services which You use on the Site by credit or debit card ("credit card"). You are ultimately responsible for the timely payment of all fees relating to any of the Services and for providing Us with a valid credit card for payment of all fees. All fees will be billed to the credit card you designated during the registration process. If you want to designate a different credit card or if there is a change in your credit card status, you must change your information online in the Chat2Psychic account section on the Site. 9.5 For any help or assistance with payment for the Services please contact Us (found under www.Chat2Psychic.co.uk/contact-us.php), write to us at: Chat2Psychic Customer Services, Orega Business Centre, 1 Hardwicks Square, London, SW18 4AW, United Kingdom or call us on 020 7966 9626. Please submit any questions You have about these Terms or any problems concerning the Site by completing the online form (found under www.Chat2Psychic.co.uk/contact-us.php), write to us at: Chat2Psychic Customer Services, Orega Business Centre, 1 Hardwicks Square, London, SW18 4AW, United Kingdom or call us on 020 7966 9626.